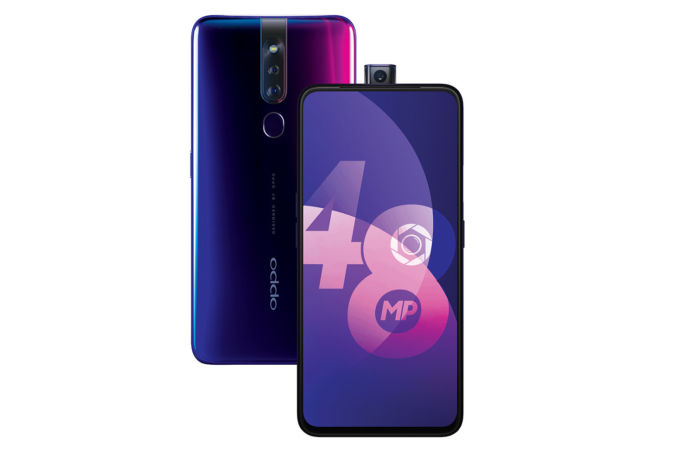 The OPPO F11 Pro has a 6.52-inch display with no notch, no camera hole, and a bare minimum bezel around all its edges. This smartphone is beautiful – and not just because it’s got a full-coverage front-facing display. This device is also colorful, and it has a rising front-facing camera, and it’s been revealed officially by OPPO just this morning. This device’s front-facing display is 6.53-inches diagonally with some considerably-rounded corners. It has a “Panoramic Screen” they say, with a 19.5:9 aspect ratio. There’s 2340 x 1080 pixels across its face, and it’s rolling with TFT LCD technology.